Some Tips To Start Your School Year Off With Ease! I hope all your lovebugs will have a great kick off to the new school year! Single moms know the morning can be a challenge when you’re trying to get the kids out the door along with yourself. Here are a few tips on making your routine easier that have worked for me. Prepare lunches the night before. Some lunch items you can prepare for the week. For example, if you pack fruit, prepack your fruit in 5 ziplock bags for the week. Then you can just grab them and throw them in the lunchbox. Whatever you can pre-baggie for the week do it! Getting dressed is half the battle. If your child wears a uniform to school have them washed for Sunday for the week and simply hang them up to be ready to go for the week. This will work for you too! Think about what you want to wear during the week and have it ready to go! 3.Prepare bookbags the night before. Make sure the homework is in the bookbag and the bags are near the door or in a closet ready to grab. Try to get the kids into the habit of putting their books into their bookbag once they’re finished with their homework. Purchase a dry erase board calendar and hang it where everyone can see it. Make this central command! On this calendar put all classes, PTA meetings, field trips, and special homework projects due. 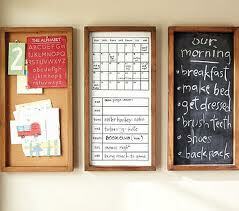 If you find one that has a cork board use it to post invitations, permission slips, etc. I’m a big advocate of eating around the dinner table so preparing a menu for the week keep us from ordering out. During the weekend talk about what dinners you want for the week. But the food, slice and dice veggies ahead of time, and try to prepare a couple meals for the week so you can just heat it up and skip all the prep time. Also remember that the slow cooker is your friend, utilize it as much as you can. If your kids have activities after school, like mine does make sure those uniforms are clean and packed in a separate bag for the week. For example, my daughter takes ballet on Monday, so on Sunday I have her ballet gear packed in her ballet bag and in my car so we are sure not to forget it. Preparation is key to getting out of the door on time! Make your mornings less stressful with just a few extra worthwhile steps! Previous PostPrevious School Supplies Are Purchased, But Are We Preparing Their Heart for the New School Year?